Check this, you need to update the bootloader too so there's not much interest in writing the fuses "alone" as it's done each time you update the bootloader from Arduino menu item. Thanks, and for pro mini, without BOD (or really low BOD), i guess I could use "optiboot_atmega328_01M_004800_NOLED.hex" file? use optiboot_atmega328_01M_009600_NOLED.hex, no interest in using the 4800bauds version as it's just half the speed to transfer scripts when 9600 is just fine (and it's the speed used by default for debug in many arduino sketches so it's also more convenient). I suggest 1.8V BOD as in some (rare) cases low voltage can corrupt memory (and then sketch, bootloader,...). Rare but 1.8V is too low for >95% of sensors and too low for radio so it won't block you for anything so it's better not to take risks. @dakipro - you should be able to pretty much lower bod in the boards file for the standard pro mini bootloader as well. I did it (i think ) somehow fallowing the tutorial Nca78 posted. And once I change the board (of fusses) I must always use avrIsp to upload sketches? @dakipro - that depends if the bootloader has ftdi upload enabled or not I think. Success! I fallowed your advice @sundberg84 and just changed boards.txt and got it to work! Simple and without custom bootloaders etc. After restarting Arduino IDE you should see new type of the "processor" of the board in IDE Tools menu. Select the new one we just created "ATmega328 (3.3V, 8 MHz, 1v7 BOD)" and burn the bootloader on the pro mini. I used Arduino as ISP to burn bootloader, and there are tutorials for that on arduino.cc. If you have real ISP, then it is a bit easier, but you need to figure out your method of uploading bootloader. Check PeteB's video mentioned bellow. This is the only time we use this newly created processor, it is not used in uploading sketches. So after bootloader is uploaded, you will be able to program pro mini "as if nothing happened", meaning you just connect FTDI and compile. But (this is very important!) dont forget to select the regular processor when uploading sketches, the "Arduino Pro or Pro Mini (3.3V, 8 MHz) w/ ATmega328", not the new one we just created. If you try using new processor, I think it will stop at compile process, so just change to regular processor. @dakipro great work and explanation. Can I use this and link from the EasyPCB site about changing BOD? There's a big advantage to running with no BOD and with no external crystal (internal resonator only): under those conditions the atmega328p can wake from sleep in less than 4usec. Over time, if running from battery or a supercap, that can save you a lot of power. The problem is if you have a low/no BOD and keep the 8MHz at some point the atmega won't be able to run with the low voltage. Also, it's better to run from internal oscillator instead of external (lower power consumption but less precise, so you should use it only if you do not need precise timing) and you need to have bootloader matching the fuse settings in board.txt for the frequency if you don't want your board to have all it's timing wrong. @NeverDie reactivating BOD takes around 60uS, if we believe the datasheet. Not much to worry about IMHO, that's one minute of on time after 1 million wake ups (so, 2 years if you wake up every minute), if running at 1MHz that's around 1mA so that's a total of 1/60 = 0.016mAh for 2 years. Is it possible to have 1MHz and low BOD, while still being able to program pro mini with ftdi? Do you @Nca78 perhaps posses such a magical bootloader? What you are doing is programming without bootloader. If you follow the tutorial I have linked earlier and use the provided bootloader files you just have to use the "write bootloader" menu (not sure about exact text in English but it's the last item in Tools menu) to update fuses and write the bootloader on the board at the same time (based on fuses and bootloader set in boards.txt). Then you should use FTDI and not use the programmer anymore, because the programmer will erase the bootloader. 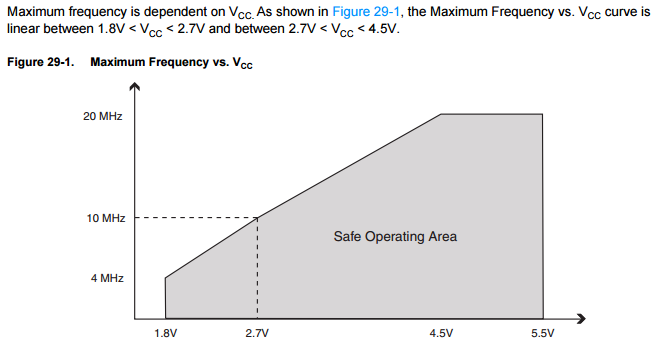 For 1.8V you need to have a maximum frequency of 4MHz. What I have understood its a balance as well. If you have large calculations/sketches @ 1mhz it will take 8 times longer to process than 8mhz, which might even increase the battery usage since its so slow. At the moment im running a motion detector @ 1mhz though and that code + MySensors lib has been working quick/great. What are you selecting as a board when you upload sketch? On mentioned manual it says "Choose your desired board which we have added before and burned the atmega328p with it." Error compiling for board APM Optiboot internal 1MHz 1v8BOD 9600baud. Error compiling for board atmega328p based - 28 pin DIL. Problem uploading to board. See http://www.arduino.cc/en/Guide/Troubleshooting#upload for suggestions. @dakipro - did you see this tutorial? Success! @sundberg84 and @Nca78 you will be proud of me when I tell you that I was doing everything "correct" all the time, it is just that arudino IDE had some stupid bug or something. I had to delete everything mentioning Arduino from the pc, and reinstall the IDE, and now all works as expected! Life is worth living again!